Researchers at The Hong Kong Polytechnic University (PolyU) have developed efficient and low-cost semitransparent perovskite solar cells with graphene electrodes. 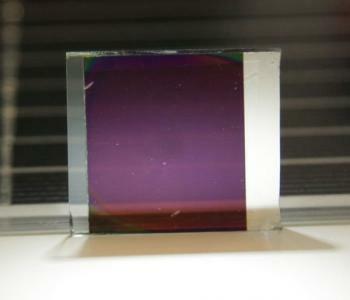 The power conversion efficiencies (PCEs) of this novel invention are around 12% when they are illuminated from Fluorine-doped Tin Oxide bottom electrodes (FTO) or the graphene top electrodes, compared with 7% of conventional semitransparent solar cells. PolyU researchers used graphene as an electrode material, after creating simple processing techniques for enhancing the conductivity of graphene to meet the requirement of its applications in solar cells. To begin with, the conductivity of graphene was dramatically improved by coating a thin layer of conductive polymer that was also used as an adhesion layer to the perovskite active layer during the lamination process. In addition, to further improve the efficiency of power conversion, PolyU researchers found that by fabricating the solar cell with multilayer CVD graphene as top transparent electrodes, the sheet resistance of the electrode could be further reduced while maintaining the high transparency of the electrodes. Lastly, the performance of this novel invention is further optimized by improving the contact between the top graphene electrodes and the hole transport layer on the perovskite films. Thanks to the excellent mechanical flexibility of graphene and the convenient preparation of the devices, PolyU's invention can be used for the mass production of the semitransparent perovskite solar cells with printing or roll to roll process. The semitransparent solar cells aims to fill the gap in the market which is not achievable by the existing solar cells dominating the market.